From Bakewell take the A6 Matlock road, follow this till just past the signs for Haddon Hall where you take a right (the first major junction) for Youlgreave, the B5056. After about 1km take the first left over the bridge. You then take the first right turn, a steep lane with restriction signs (don’t worry there’s access for cars but no wide vehicles). Take the first left you come to by the barn and then just follow the road, up through the woodland where the lane narrows and turns steeply up hill, shortly after you’ll see Robin Hood’s Stride to your left and the entrance to Harthill Moor farm on the right, park up on the lane and walk up the farm road where you should seek permission from the farm house as the site is on private land though you can follow the Limestone Way footpath around the back of the farm to view the remains there. 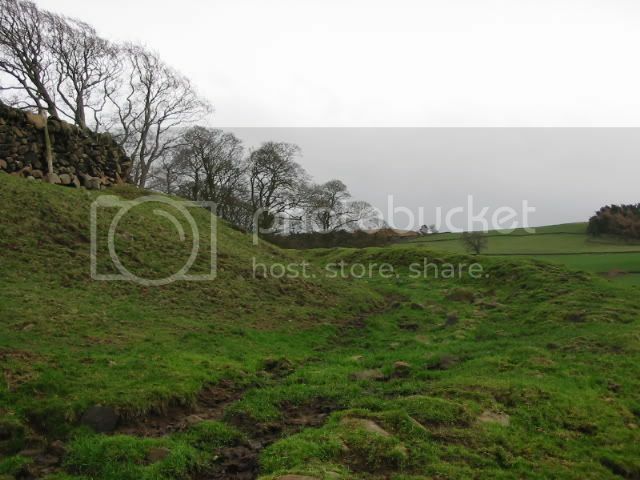 Castle Ring is a tiny Hill fort enclosing a 3/4 acre settlement / retreat, the ditch and bank are well preserved though a section to the SE is now missing where Rooke reported an entrance once existed.